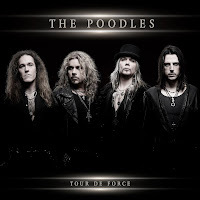 Rock & Metal 4 You: CD-Review: The Poodles - "Tour De Force"
The Swedish melodic metal /hard rock band THE POODLES is back! I have been following the career of these guys since their start with their stunning debut album "Metal Will Stand Tall". That was in 2007. Since this time lots of things have changed. Guitar player Pontus Norgren left the band after two amazing records and he was replaced by Henrik Bergqvist in 2009. With this line-up change also the band sound changed more and more in the following years. So, now I hold the promo of the bands new album "Tour De Force" in my hands. Can they beat their past successes with this one? To get straight to the point: sadly, sadly ... no, they can't! This is due to some reasons. A few years ago The Poodles were my absolutley metal heroes. I loved their two first records and also their live performance was (and still is) powerful. So what happend? With their third album "Clash Of The Elements" the band took a look on a more epic sound. I didn't felt comfortable with that, but for sure this album had still it's great moments with songs like "I Rule The Night", "No Tomorrow", and so on. The big trademark of The Poodles were always their big hooks and strong melodies, especially in the choruses. So let's say "Clash Of The Elements" had still 80 percent of these songs. The next album "Performocracy" sadly continues the trend of a more epic and darker mood, but even here you had 50 percent of the typical Poodles-feel-good-songs. Just remeber "Until Our Kingdom Falls", "Vampires Call", "Cuts Like A Knife", "Bring Back The Night" .... all amazing songs. So what do we get now on "Tour De Force"? Maybe just 30 percent of that what made this band so famous ... you can't imagine how disappointed I am in this moment. "Tour De Force" sounds more rough, maybe a bit harder than the last album, but also much darker and more modern. I know, singer Jakob Samuel said in my interview he thinks the sound of the band is not so far away from their roots .... but damn yes, they are far away from their origin sound and something like "development" can't be an excuse for weak and uninspired songwriting. This is the biggest problem here, because the talents of the musicians and the producion are top-notch. There is nothing to complain about. You get a really crispy production, which really rocks, but sadly the songs themselves can't thrill me. So let's have a look at the songs: the opener "Misery Loves Company" is ok, but nothing outstanding. The chorus works after a few listenings. After this comes the first total fail: "Shut Up!" This song is also presented very well, but nothing stucks in your head. Where are the big hooks? With the song "Happily Ever After" you also recognize that the tracks are very similar to each other. "Viva Democracy" don't change a thing on this fact. This is a moody tune with a darker note - just like the three songs before. Next song "Going Down" is also ok, not bad, but also nothing that blows me away. It's one of the harder ones on here. "Leaving The Past To Pass" is the only ballad on this album ... and yes this song is also far away from the band I once loved so much. I remember power-ballads like "Rockstar", "Shine", "Time Is Passing By", "Wings Of Destiny" ... all beautiful ballads, but this new one here can't touch my emotions. For sure it is very good sung by Jake Samuel, but it can't reach my feelings. Speaking about Jakob Samuel: he is still an amazing vocalist with a unique voice and he rescues some average song from the total irrelevance. So after six songs the first track arrives that reminds me a bit at the typical Poodles-style: "40 Nights & 40 Days" is the first song of this album that stucks in my head after I've listened to it once. Really good tune. Some will now say not every song has to be an earworm after the first listen and yes, you are definitely right, but it can't be that I've listened to this album for many times now and just 30 percent of it is remarkable. Especially for a band like the Poodles, which is known for their stunning, catchy melodies. Next song "Kings & Fools" is also one of the harder and more modern rocking songs. I can repeat what I said: I don't like this style. At least the chorus is good and the guitar solo is also really cool. So in the end this is one of the better songs on this album. "Miracle" is a classic melodic rock song, but with an absolutely replaceable melody. "Godspeed" is the pure opposite of melodic rock. This is again a darker song with modern approach. I could really cry. The Salvation comes with "Now Is The Time" ... maybe the best song on this album and the only one, which could have been on the great "Metal Will Stand Tall" - album! Cool track! Sadly the last track "Only Just Begun" is some of those average songs again. Let's talk about the bonus track "En För Alla För En" ... this is so funny, because this song is better than 80 percent of the main record. It has this feel-good-vibe in it, which I hardly miss on the whole album. This track is more commercial, but this is a welcome contrast to all the other songs. Just a very good sing-along track. You see, to me it's the biggest disappointment in 2013 so far. My former melodic metal heroes have developed in the totally wrong direction. Guys, please put the epicness and your darker/modern approach aside and bring back the great melodies and all the metal anthems you've written in the last seven years. If you never heard from this band so far you can take a look on "Tour De Force", because it definitely rocks and with more objectivity you might like this album. The production is perfect and every song is presented and played very well. You'll also hear one of the best voices in melodic metal, so you can give it a try. But if you are a die-hard fan like me, who loved this band right from the beginning ... then this album is a slap in your face, because you hardly find the trademarks, which made this band so great and enjoyable. So to me it's nothing more than solid work, nothing special here and believe me, I really hate to say that. The Poodles got more worse with each album and "Tour De Force" is no exception of that ... no, it's the weakest album they've done so far. Really sad.